These are the top places to kayak or canoe along North Texas waterways. In looking for a good river to paddle, Dale Harris of the Dallas Downriver Club explains his top three criteria: good water flow, access to the river or stream, and the quality of the water and surrounding environment. “No water flow means no paddling,” Harris explains. But how to determine whether good water flow exists? “Texas has water gauges that monitor water height and flow in cubic feet per second. The gauge information is available to the general public and is posted on the U.S. Geological Survey website,” Harris says. Always check that site before you head out for your paddling adventure. You need to know about public access points to the river or stream as well, such as boat ramps or basic canoe or kayak launches near public parking. “You need to determine the distance between public access points. Dallas Downriver Club likes to paddle 4 to 6 miles on a short outing,” Harris says. The final factor Harris suggests examining is the actual water. “I look at the water, as in, is it clear, fast, rapid, and what is the scenery? Is it full of trash? Is the bank loaded with homes and business? Or is it basic wilderness even though you are close to civilization? For example, very little of the Elm Fork or Main Fork of the Trinity River has houses or businesses within site of the bank, so the riverbank is full of old growth trees and an abundance of wildlife,” he says. A river run maintained by the Trinity River Kayak Company, it goes from the TRKC launch (off Sandy Lake Road in Coppell) to the California Crossing Dam, about 10 miles downriver. Using the TRKC has many bonuses: you can rent a canoe or kayak from the TRKC, and TRKC will bring you back from the California Crossing Dam; however, there is a fee for using TRKC’s launch. If you want an “all-inclusive” package — kayak and all necessary gear, boat launch, shuttle back to TRKC after your run, and a history of the river and the area — you’ll pay $45 for the Iron Man run. Shuttle only service — meaning you just need to use TRKC’s launch and shuttle service but have your own gear — will run you $20. Another TRKC urban adventure, the paddler uses the launch at TRKC and paddles to Irving’s T.W. Richardson Grove Park, about 5 miles away. The first part of this trip is shallow with a gravel bottom, but it has a few spots with some bends and fast water. If you want to use TRKC’s services, the all-inclusive package is $36, and the shuttle-only service is $15. The water coming out of the dam is cool, and the river bottom is gravel. The water flows quickly for a couple of miles before it slows down. The dam access is managed by Lewisville Lake Environmental Learning Area and is only open on Fridays, Saturdays, and Sundays for paddling. You’ll pay a small fee to use the facility’s launch. The next public river access — and thus the next spot you can leave the river — is at McInnish Park in Carrollton, which makes for about a 12-mile paddle. D Magazine’s Tim Rogers paddled the Trinity River whitewater feature recently and told his story of the account here. 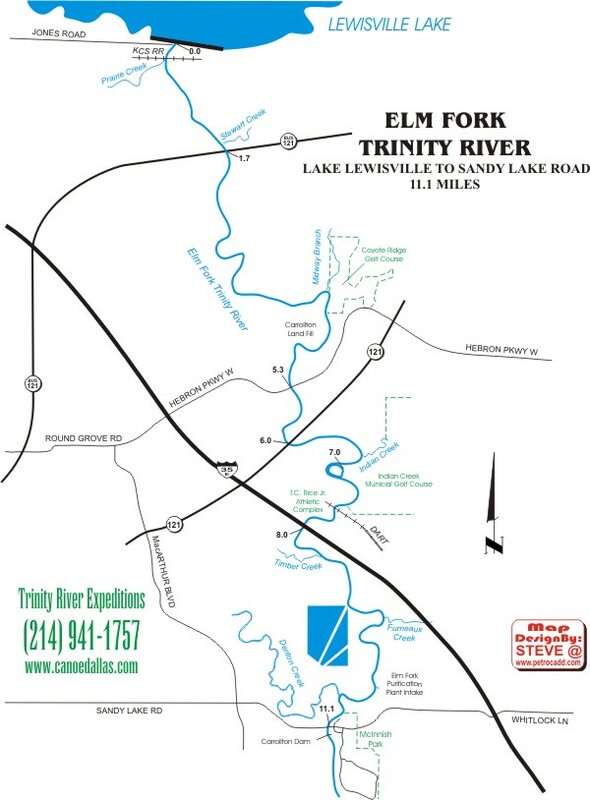 The full run is about 6 miles and is part of Texas Parks and Wildlife’s “Texas Paddling Trail.” You can also paddle upstream from the Standing Wave Park to the Margaret Hunt Hill Bridge. One of the nicer features about Rowlett Creek is that you can paddle upstream or downstream into Lake Ray Hubbard. If you want to try both river paddling and lake paddling, this is a good option. There is a put-in where Miller Road crosses Rowlett Creek near Lake Ray Hubbard.